We saw this Oscar-nominated documentary in an open-air cinema, perched on the Fort Canning hillside in Singapore. It was a magical way to see an, at times, heart-stopping film about the gorillas in Virunga National Park in the Democratic Republic of the Congo. In 2007 we had the privilege of visiting their cousins round the mountain in Rwanda and Uganda, three of the best days of my life, getting up close and personal to three different family groups. Having been told to stay well clear to prevent infection, I jumped out of my skin when a little fellow (well, not that small!) called Big Ben somersaulted over my back from behind! Since then I have followed the mountain gorillas’ fate closely: I mourned when poachers killed a whole family in order to try and spirit away the babies to be sold as pets in far-away countries – one of the early scenes in the movie. Two of the young gorillas in the Virunga nursery are survivors from this slaughter, and they are mothered and fathered by a wonderful ranger, Rodrigue, who at one point says, ‘You must justify why you are on this earth – gorillas justify why I am here, they are my life. So if it is about dying, I will die for the gorillas’. And indeed it looks as if this might be on the cards, when Congo’s volatile politics unleash the latest round of anti-government thugs on the locale, in the form of the well-equipped M23 fighters, who use the National Park as their battleground in the fight for control of Goma. In a civil war which has lasted over 50 years and still shows no sign of ceasing, and which has claimed over 6 million lives (the equivalent of the Holocaust to put it in perspective) there are no winners, only losers: the local people, especially the women and children, and the wildlife. In the battles scenes that follow, and in the run up to them, there is secret and hand-held camera action worthy of the most nail-biting drama. As in any Hollywood movie there is a baddie, here in the form of British oil company SOCO, which is riding roughshod over Virunga’s UNESCO world heritage status and an agreement with the government not to drill on National Park land, bribing all who stand in its way. French journalist Melanie Gouby takes many risks in trying to unmask SOCO’s underhand dealings. What with the ‘goody’ in the form of Prince Emmanuel de Merode of Belgium as Chief Ranger (Downside and UCL), who teaches the values of conservation to his 600-plus armed rangers, and tends to the safety of man and gorilla alike in the face of danger, we have all the ingredients for a blockbuster, albeit non-fiction. And indeed, this is the aim. 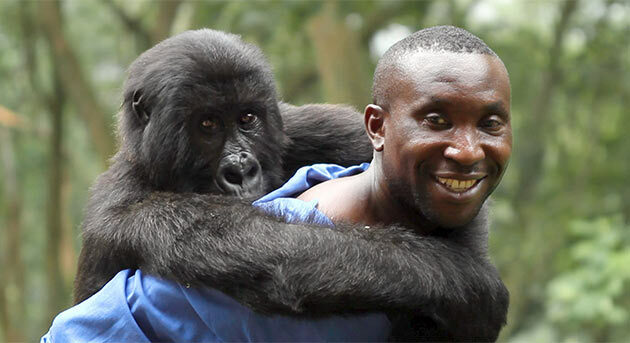 The film was made in order to draw attention – and I guess funding – to the plight of the mountain gorillas in DRC. It is only in reading up afterwards that I discover a missing balance to the narrative. Virunga National Park was founded by wicked King Albert 1 of Belgium, descendent of the cruel King Leopold, who colonised Congo and introduced slavery on an inhuman scale. Two million areas of village farmland were expropriated and whole communities displaced: apparently the locals remain unsurprisingly ambivalent about the park, which perhaps explains why so many of them are eager to accept SOCO’s inducements. While the movie makes much of greedy westerners descending on DRC for its minerals, it fails to look even-handedly at Virunga’s own story, not least the irony of the relationship of its current boss to Congo’s worst predator of all time! Similarly, while there is little doubt that Gouby’s journalism is brave, there is no mention of the numerous other Congolese civil rights activists who campaign tirelessly against SOCO and its land-grabs. There are worries that the paramilitarily-trained rangers form their own unit of ‘machine guns in the mist’ and defend wildlife at the expense of people, that they are not unlike the armies led by local war-lords such as Joseph Kony. Africa is so much more complex than this film suggests, and there are many Africans who are a force for good, exemplified by some of the rangers who risk their lives to film the corrupt officials, but otherwise are largely ignored. Having said all of that, the film-makers obviously had a brief and that was to bring the plight of the gorillas into the limelight. It was not to give a detailed exposéof the never-ending civil war, its causes and its major players. Nevertheless Virunga could perhaps have shown a little more judiciousness, instead of the rather simplistic black and white, south vs north conflict, where even when the baddies are whites, there is an even better white to save the day. But the scenery and gorillas are simply wonderful to behold and a little knowledge is not always a dangerous thing.